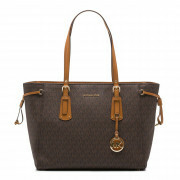 At Brandfield you buy the best Michael Kors bags, like this Michael Kors Voyager Brown Shopper 30F8GV6T2B-200. Be the best version of yourself with a Michael Kors shopper! Buying a shopper at Brandfield is safe and easy in our online shop. We are official dealer for Michael Kors bags. You receive the standard warranty of 2 years. Take a look at the complete collection of Michael Kors bags in our online shop.